"We're obsessed with providing a terrific experience. If not, we'll make it right - guaranteed." Pick when and where to deliver this gift! Sending outside the US or Canada? Please select an item delivered by a florist. Don't know the recipient's delivery address? Click here! celebrations passport® has been added to your cart. for One Full Year Across Our Celebrations Family of Brands. * One year membership starts immediately with today's purchase, membership fee refundable within 30 days. Automatic one year renewal for $29.99 as an added convenience, cancellable at any time. Orders must be placed two or more business days ahead of delivery date. Offer subject to delivery rules. Florist Fulfilled items are generally available for delivery 7 days a week. Direct Ship products can only be sent within the continental United States. Click here for complete Terms and Conditions. **Same-day delivery is available on Florist Fulfilled items for a reduced service charge. 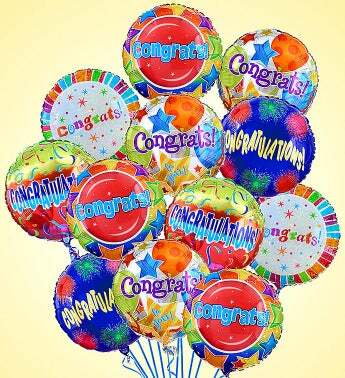 Give them a little extra lift with a festive "arrangement" of Congratulations Mylar balloons. Selected by our expert florists, they're a great way to congratulate someone special for any occasion, from a new job or promotion to a new baby or housewarming. 1. Expertly arranged & hand-delivered by a local florist in your recipient's zipcode. Same-Day Delivery is available in most areas of the U.S. and Canada when placed by 2:30pm M-F; 2pm Saturday and 11:30am Sunday in your recipientst time zone. For fruit bouquets, order must be placed by 11am. 2. Shipped fresh overnight from one off our premier floral farms and delivered Next-Day via FedEx or UPS in a signature gift box, ready to be arranged. We do everything we can to make sure your recipient's gift arrives exactly as requested, but sometimes substitutions may be necessary due to availability. Please know that in each instance, the utmost care & attention is given to ensure that your gift is as similar as possible to the requested item and is received in a timely manner. Give them a little extra lift with a festive arrangement of Congratulations Mylar balloons. Selected by our expert florists, they're a great way to congratulate someone special for any occasion, from a new job or promotion to a new baby or housewarming. Your email address has been submitted! We Found An Account Matching Your Profile.